August 12, 2018, 6:01 AM · Greetings from Greece! Can you help me with some photos of your shoulder pad? I need some ideas to fit my shoulder pad without rubber bands. I quit my shoulder rest and i feel more liberated and freedom but i need something more secure than rubber band. I appreciate your help. August 12, 2018, 7:21 AM · A microsuction material like this: "AirStick White Microsuction Tape By Sewell, 0.8mm, 250mmx300mm Sheet" that is available from Amazon.com provides for decent suction to the violin back. August 12, 2018, 7:30 AM · Microsuction backing is also used on the Acoustagrip shoulder rest now sold by many dealers. I now use the Acoustagrip for violin and viola playing (same one for both instruments). I learned of it from a music colleague who uses it on his $150,000 Enrico Rocca violin, so I would not worry about damage to the instrument. My computer would not let me editmy previous post this morning - so I just added this one instead. August 12, 2018, 8:22 AM · Thank you Andrew! I bought acoustagrip but it didn't fit me i find it too soft. Microsuction backing of acoustagrip didn't work because my violin need varnish- polish restoration and its back is not like "glass" and the acoustagrip falls all the time. But its an excellent product if you have your back of your violin polished. August 12, 2018, 9:22 AM · Have you tried tucking the pad under your shirt, or under the jacket if you're performing? August 12, 2018, 11:39 AM · Dimitris, your custom shoulder pad is so much like a "Poehland" rest that I can't help thinking that you might as well just get a Poehland. Still, I think there are much better solutions. And I've tried micro suction shoulder rests, and while effective, they were affecting my varnish is an unacceptable way. I'll try to overcome the need for a photo hosting website that violinist.com requires and post my suggestions, but honestly, I think you should just post your question on maestronet.com where photo posting is so much easier and you'll get the photo responses you're looking for. I'm sure that Laurie will be annoyed by my saying that, and might even take my post down, but that's JMHO. Get yourself a real tall one and a strad pad (I guess a cloth works, too). You will never look back. August 12, 2018, 4:45 PM · What's wrong with the rubber band? Is the pad moving around? August 12, 2018, 5:17 PM · Maybe you could fix the rubber band (or better some elastic band/cord from a fabric shop) to the pad with a few stitches. It may stabilize the whole thing. For myself I prefer a shoulder rest that stays clear of the bottom (not too tall!) over a pad that touches it. I always fear it will influence the tone if it doesn't let the wood vibrate freely. August 13, 2018, 1:38 AM · Erik, exactly with some changes of the left hand i feel movement under my violin. I order the Andrew's suggestion , the microsuction tape, and the second solution will be elastic cord with stiches. August 14, 2018, 1:27 AM · You may want to look into the "play-on-air" pads. August 14, 2018, 2:29 AM · I believe the play on air pads are too big and i read not so good reviews for them. August 14, 2018, 2:39 AM · Ray Chen's shoulder rest is a prototype by his friend, and they unfortunately have not brought it to market yet. August 14, 2018, 4:53 AM · I use a shoulder rest that is about 2 cm from my viola at its lowest point. It's a Mach One shoulder rest retrofitted with Everest feet so that it can be adjusted much lower. 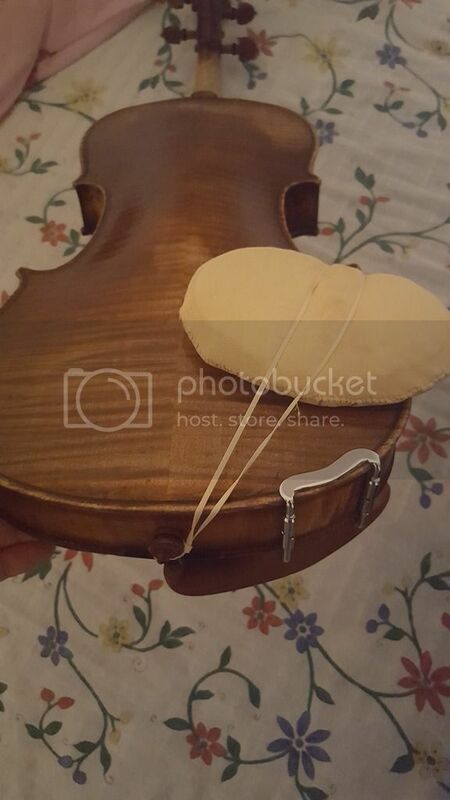 August 15, 2018, 1:52 AM · I had the pirastro korfker rest which was at its lowest point about 2 cm... but the edges were much higher and bring the violin to a fixed tilt. Edited: August 15, 2018, 5:36 AM · My first violin teacher told my parents to buy a kitchen sponge. Cheapest option. It tended to move around, whatever you did with the elastic bands. I think my mother eventually made one with a cloth cover and holes in the corners, which was better. When we had funds to get a shoulder rest that seemed like an upgrade. The best and best-funded players at school had fancy shoulder rests, covered strings instead of bare gut, and bow and violin and case from Hills in Bond Street. Sadly I never got the hang of keeping a relaxed neck with a shoulder rest, or of stopping a pad slipping, so gradually acquired the knack (with guidance) of supporting the instrument with the left hand instead. Of course, Zuckerman, perhaps influenced by Stern, uses a pad *under* his jacket. Had I known about it I could have tried it, although it does mean you cannot practice without a jacket :-/. It is a method not available to glamorously dressed lady fiddlers! Edited: August 15, 2018, 7:58 AM · "Is it possible to learn play restless or padless and do all the various vibrato at this age? I am 37 old dog :P "
EDIT - a difference than those other things, is that once you get comfortable with the habit it is more or less second nature, not something you need to work to maintain. Edited: August 15, 2018, 5:10 PM · I'm able to play both ways, with and without SR in a relaxed manner, without any technical problems more than anybody would have in his 3rd year of learning. Especially shifting isn't an issue, neither downwards nor upwards. Vibrato also works, although this could be definitely improved overall. No, I'm not playing great, mediocre at it's best on a low intermediate level. I was introduced to the violin with SR by my first teacher, but never found a comfortable and relaxed approach. I tried all different kinds of SRs and CRs, but nothing helped. Until I saw the tutorial videos of that guy who invented the "kreddle" CR. I got one, played a lot around with it and learned how my body works. It's interesting, like somebody here already mentioned before, that I only learned how to play with SR after I learned how to play without... Maybe this would be a nice way to go for you, every body is different, and the Kreddle helps you deal with that. Now there is also a relatively new option for adding a small cushion where the violin sits on your collarbone, but I haven't tried this and I'm not sure if this wouldn't hinder storing the violin in the case. For me, a small strad pad or even more simply a piece of chamois (or microfiber cloth) does the job good enough. Now when I understood how things work for me without clamping the instrument with my jaw, I'm rather the SR guy again and use a Wolf forte secondo and an ordinary CR, I think it's a Flesch model. On another violin I don't have any problems with a Guarneri model, which I also use on one of my violas. Another viola wears a Teka. The violas I play strictly without SR but only wit a piece of chamois, otherwise the whole thing gets a bit too high. Edited: August 15, 2018, 5:15 PM · ... in case you wonder why I do not use the Kreddle anymore? For my taste the contact plane for the jaw is a little bit small and hinders flexibility while playing - in my special case. And it doesnt really matter anymore to me, as long as the CR isn't especially high or a centered model. And on baroque instruments I can play completely without, so what..? But for the learning effect it was worth every penny! August 16, 2018, 2:04 AM · I bought Kreddle and i don't use it anymore for the same reason. The contact plane is too little... i have a collection of chinrests... Now i add cork to some of them just to increase the height. August 16, 2018, 5:14 PM · I had an idea today... i have the gelrest micro but it is too thin only 9mm. I like the idea of Andrew with microsuction tape of 8mm, so i bought this ( https://www.materialsampleshop.com/products/micro-suction-tape ) from Denmark .I hope this tape is the same with Microsuction tape by Sewell. Sewell tape is only available to US stores with increased shipping costs. I will cut and stick the tape to the back of gelrest micro. So i hope to have a pad of 17mm thickness.